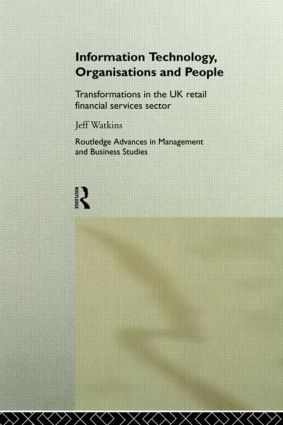 This wide-ranging volume presents in-depth research into the effect of new information technologies on organizational structure, assesses their progress towards transformation and describes the changes they are making to long-established business process roles, cultures and working practices. The book is based upon a series of rolling surveys carried out between 1989 and the present day, and funded by leading organizations such as IBM and KPMG. It provides a detailed picture of a sector in transition during a period of anxiety and doubt dominated by restructuring, downsizing and experimentation with re-engineering. As the 'lean and mean' emerge, they must now ask themselves if their competencies will enable them to survive into the next decade as competitors, such as Sainsburys, Virgin, Microsoft and Ford position themselves to become major players in the sector. This book is a major contribution to the debate on the growth of knowledge work, the need for core organizational competencies in the information age and the need for evolutionary, or radical, change.